A fellow editor noticed this ad that appears in Tuesday’s Gazette. It’s an ad for Ford that seems pretty generic until you think about it for a second. The text says “Passion to go the distance”. Penguins in the windshield, and in the rear-view mirror is the Capitol Building in Washington. At the bottom, the logo of the Canadiens. 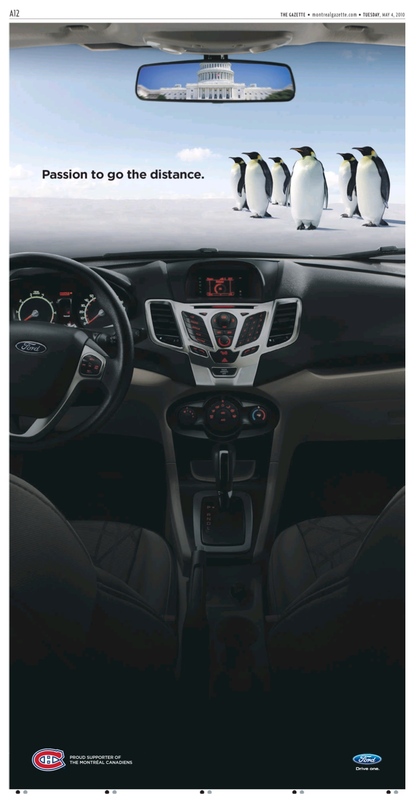 Ford hasn’t had the best of luck trying to be funny in advertising in Canada, but this one was pretty cute. Not the most subtle ad ever created, but still relatively clever. And hey, full-page colour ads pay my salary, so I’m not going to complain. There was something I read recently (and, of course, can’t find now that I want to link to it) about car companies wanting to stop having Canadian firms develop their own marketing campaigns. Instead, they could just use U.S. ads in Canada. This is a pretty good reason not only to keep Canadian-specific ad campaigns, but locally-focused ones. Makes me wonder what was being run over in the Pittsburgh ads. I don’t get it? Penguins are only found in Antarctica. Aren’t they trying to point the car north? Unless they’re saying all of Canada’s best athletes go south. But that’s not very lol. soup: um, ever hear of the Pittsburgh Penguins?